« HDTV Antenna -Indoor Amplified Ultra Thin $3.99 + Ships FREE! Cut That Cable Bill Ans Snag This Awesome Deal! I do not know about you, but one of my all time favorite snacks is a Rice Krispies treat! However, I have found something that is even better! It is this recipe for Mint Chocolate Rice Krispies Treats. If you love mint and chocolate, this is one of those MUST try recipes. I do not know if I will ever make the plain ones again because these just taste so wonderful! When making this Mint Chocolate Rice Krispies Treats recipe, it is pretty much like you would make the normal ones with just a few things different. I think it is a pretty nice mix of the mint and chocolate, however, feel free to add more or less of the mint if you like. This is made using chocolate Rice Krispies, but if you do not have any, you can use plain and add some cocoa powder in. This is one of those recipes you will want to make when you have to take a dish somewhere or if you will have a lot of kids in the house to help. It is not a diet friendly recipe, and if you are anything like me, you can not be left alone with these….lol. Spray a 9″x13″ baking dish with cooking spray and set aside. In large sauce pan, melt butter on low heat. Once melted, stir in marshmallows and continue to stir. When marshmallows are melted, turn off heat and stir in chocolate rice Krispies. Once thoroughly mixed, stir in Andes baking chips. Scoop mixture into baking dish, making sure to spread evenly and press into corners. Set aside to cool. In a double boiler, or in the microwave, melt chocolate chips. Once completely melted, spread across top of rice Krispies. Spread evenly and to the edges. Sprinkle the remaining Andes baking chips across the top. Let cool for a couple of hours, or put in the refrigerator. Cut into desired size and serve! 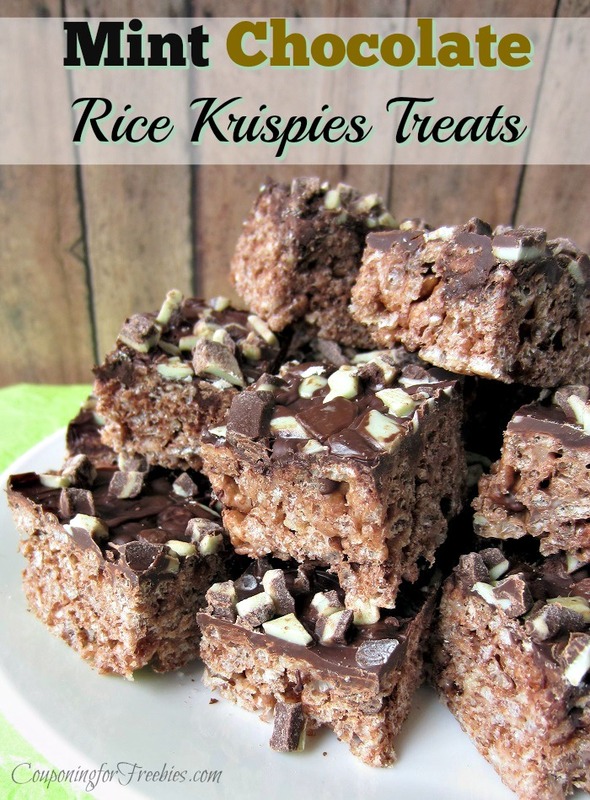 Like this recipe for Mint Chocolate Rice Krispies Treats? Here are a few others to check out.